Just in time for the local sweet corn season, Chai Pani in Decatur offers this recipe for a refreshing summer salad. Cumin Lime Dressing will store in the refrigerator for a few days, so use any extra to dress a salad of lettuce or arugula, grapefruit slices and avocado. Preheat oven to 450 degrees. Place unhusked corn on baking sheet and roast until the husk can be peeled back to reveal lightly browned cork kernels, about 40 minutes. Remove from oven and cool. Remove husks and cut kernels off ears. 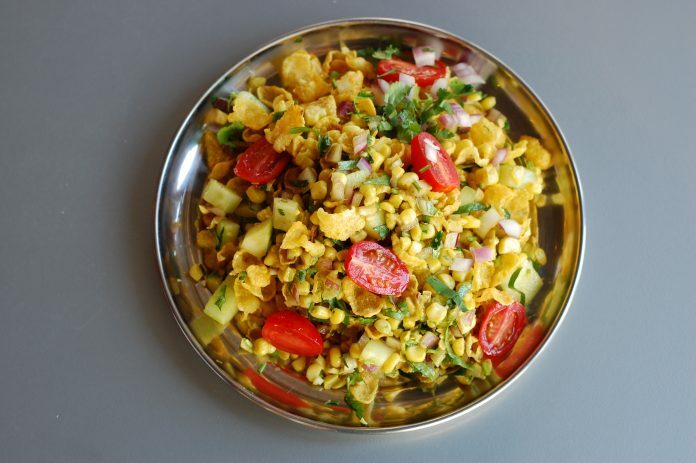 In a mixing bowl, combine roasted corn kernels, poha or corn flakes, onion, cucumber, tomatoes, and cilantro. Toss with enough Cumin Lime Dressing to moisten. Garnish with mint. In a food processor or blender, combine the onion, cilantro, garlic, cumin, sugar, salt, and pepper. Once the ingredients are pureed, turn processor to medium-high and add the olive oil in thin stream until fully incorporated. Store in refrigerator.